A wheelbarrow is a small hand-propelled vehicle, usually having just one wheel. It is designed to be pushed and guided by a single person using two handles at the rear. Manual wheelbarrows will get the job done, but just because they have a wheel on them doesn’t make them any easier to move along, especially with a lot of cargo inside. Even on hard surfaces, moving heavy objects relying on wheels and the power of your back isn’t easy, and it becomes nearly impossible across rough ground (Source). Unless, of course, you have a motorized wheelbarrow. A motorized wheelbarrow can load anything from around 90 kg up to more than 300 kg. In this article we will be looking at the top five motorized wheelbarrows available on the market this summer. 7.1 1. Wheels OR Tracks? 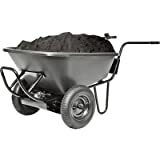 This wheelbarrow has a large hopper and a load capacity of 300 kg on flat ground. The YardMax YD4103 is the perfect workhorse for any building contractor, farmer, or homeowner with a large yard. The 208cc Briggs & Stratton engine provides a reliable powerhouse. This engine is both EPA and CARB certified. Power is transferred through a heavy-duty transmission with 3 forward speeds and one reverse to all four wheels. One thing you might want to consider is that while the all-wheel drive and the directional AG 16-inch by 4-inch tires are perfect for rough uneven terrain, mud, and gravel, they’re not great for manicured lawns. Despite being a heavy 160-kg machine, the YardMax is nimble and easy to operate. The Briggs & Stratton engine starts with an easy pull on the recoil starter. After that, you engage the speed that you want (first, second, third, or reverse) and move over to the controls that are placed at the two handles. The steel hopper has a tough coating that doesn’t look like it will scratch very easily – even when loaded with bricks and rubble. You release the hopper with a lever and then it’s able to tilt a full 90 degrees for emptying your cargo. 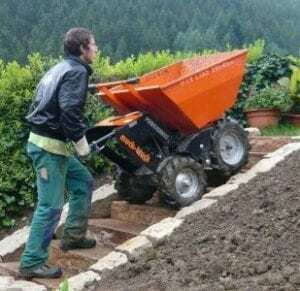 This motorized wheelbarrow is beautifully designed and is capable of moving up 100 kg (220 lbs). 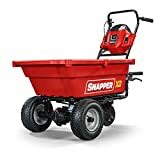 The Snapper XD 82V Max self-propelled utility cart is of great help in moving heavy materials and supplies. With the quick-release lever you can effortlessly dump the attached cargo bed. Carry, dump, or tow materials for up to three hours on the 2Ah Briggs & Stratton Lithium-ion battery. The rust-resistant cargo bed and large turf drive tires allow you to move a variety of things without damaging your lawn. With this motorized wheelbarrow you get up to 3-hours (180-minutes) run time with the Briggs & Stratton 82V lithium ion 2.0Ah battery. For faster charging, we recommend the Snapper XD BSRC82 Rapid Charger that is sold separately. In addition to the standard battery, a number of other power options are also available: Battery Briggs & Stratton 82V Max Lithium-Ion 2Ah, 4Ah battery or 5Ah, all of these sold separately. This motorized wheelbarrow is your unstoppable workhorse. With two forward and one reverse speed options, it can go at a full speed of 2.6 mph. It is also equipped with a heavy-duty transmission and a reinforced steel frame for added durability. 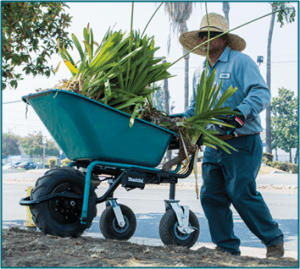 Despite its modest load capacity of just 275 lbs (125 kg), the Makita XUC01X1 3-wheeled motorized wheelbarrow is built as a tough and tireless workhorse. It has some amazing features that make it an incredibly versatile machine. The single driving wheel at the front is large enough to handle just about any terrain and it has excellent tread. This motorized wheelbarrow is powered by a brushless motor using Makita’s 18V LXT lithium-ion batteries. It normally uses one battery at a time, but you can use two to increase your working time. On a single battery, the Makita XUC01X1 will run for approximately 60 minutes. It has two speed options, as well as one reverse speed, and can reach a maximum speed of 2.5 MPH, even on a 12-degree incline. The mechanical 7-inch disc brake is controlled by a lever on the handle and gives the wheelbarrow great stopping power and excellent control on a decline. Probably the most innovative design feature on the Makita XUC01X1 has to be the adjustable rear caster wheels. These wheels are attached to a super-tough adjustable frame. This means that you will be able to adjust the width of wheelbase between 19 and 30 inches. It can move along really narrow pathways and still have the stability of a wide wheelbase when needed. Alternatively, you can remove the caster wheels and replace them with L-shaped legs. This will turn the Makita into a single-wheeled motorized wheelbarrow. 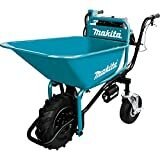 As with all Makita products, this motorized wheelbarrow is designed to withstand some harsh treatment. The controls and electric components are protected by Makita’s Extreme Protection Technology (XPT), so you don’t have to worry about dust and moisture damaging the electronics. The Makita XUC01X1 is built on a tough steel frame and has a steel hopper with a very durable coating. Despite the strong steel construction of this machine, it weighs only 40 kg and is therefore easy to move about. Its soft-grip rubber handles also help to reduce user fatigue. This wheelbarrow is fitted with headlights on either side, which can be very handy if you need to operate it at night. It also has an optional steel flatbed for carrying bulky loads. Last but not least, it comes with a 3-year warranty. If you are a contractor with things to do, not for you. 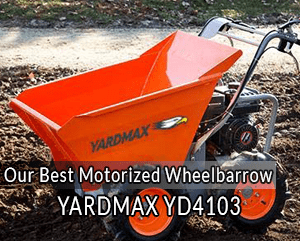 This motorized wheelbarrow is as good as a Makita, but it is offered at a much more comfortable retail price. 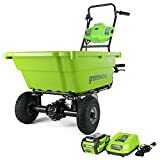 For an easy to use motorized wheelbarrow meant mostly for regular gardening, the Greenworks GC40L410 is an amazing machine at an incredible price. As with all Greenworks products, you get excellent manufacturer backup and a really impressive four-year warranty. This three-wheeled motorized wheelbarrow is not built as sturdy as the Makita, nor is it as adaptable to different working conditions. It remains a good machine for regular yard work. Greenworks is a great brand for affordable gardening equipment with a high level of quality. This is a 3-wheeled power wheelbarrow with two driving wheels at the front and a single caster wheel at the back. The 10-inch wheels are a good size but are not designed for heavy mud or low traction conditions. These are turf tires and are perfect for using around the garden as they won’t tear up your lawn. The Greenworks GC40L410 uses their 40V 4AH battery which is used in a variety of other Greenworks gardening tools as well. It takes only 2-hours to charge and you can expect to get around 40-minutes working time on a single charge. It has a large adjustable handle and a brake for the caster wheel that is foot operated. Releasing and tipping the hopper is made really easy with a release lever and a handle at the base of the hopper. The whole thing weighs only 35 kg and is really easy to move around the yard. For a little more than what you’d pay for the Greenworks power wheelbarrow, the PAW 24V (44019) model may be a better option for some. 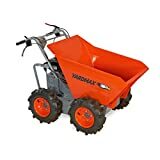 Even though this is a 2-wheeled motorized wheelbarrow, it has the advantage of a really large removable hopper and a really strong steel frame. Using the two-wheel design means that you tilt it like you would a regular wheelbarrow when want to empty the hopper. The long handles that give you plenty of leverage. It has a weight capacity of 90 kg. The forward and reverse operation is done by pressing a switch and it has a variable speed control. This motorized wheelbarrow uses 2 sealed 12V 9AH AMG batteries connected in series. These are deep cycle batteries, designed for heavy-duty applications and should give you many years of usage. No frills, no fuss – just enjoy this machine’s incredibly simple operation. This makes the PAW 24V power wheelbarrow a tough workhorse that is certainly going to last for some time. The 13” wheels are a great size and turf tires mean that it won’t harm your lawn. Though it only has a 1-year warranty (less than any of the other models), you can rest assured that this motorized wheelbarrow is going to keep working for quite some time without giving you any headaches. Motorized wheelbarrow models are equipped with one, two, three, or four wheels. Naturally, the single-wheel models are the least stable, but are the easiest to maneuver. Motorized wheelbarrows that use tracks are usually larger than every four-wheeled motorized wheelbarrow and can handle larger loads. The biggest plus of using tracks is in their ability to handle an incline of up to 45 degrees. Large three or four-wheeled machines that are capable of carrying a lot of weight may use electric or hydraulic motors to drive the tipping mechanism. A large motorized wheelbarrow that uses a gas engine is preferable for site work and farms. If you have a particularly large yard, you may also prefer one of these machines. For most home users, battery-powered wheelbarrows that aren’t too big are the best choice. They’re easier to maneuver around the yard, practically silent and require very little maintenance. Buying a motorized wheelbarrow is not an easy task. First and foremost, your choice should be determined by the specific job that you want to do with it. 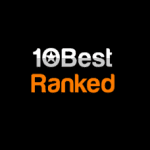 Having read our review, you can now be sure that you have the necessary info to make a reasonable choice!